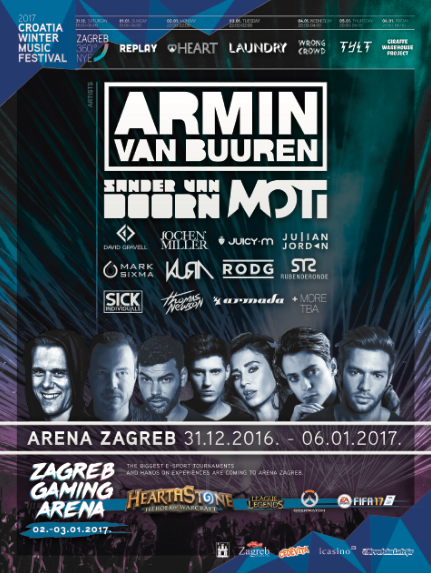 Croatia Winter Music Festival, the country’s brand new concept combining music, food and gaming, will take place at Arena Zagreb, Croatia from 31 December 2016 to 6 January 2017. Grammy-nominated Dutchman Armin van Buuren will headline the NYE party, the first of six events over the week that will host performances from a selection of DJs. During the daytime on 2 and 3 January, the sports hall will host Zagreb Gaming Arena, an international gaming tournament where contestants will pit against each other playing some of the world’s most popular and competitive games. The week continues on Sunday 1 January 2017 with REPLAY 360° NYE, which will be hosted by Ibizan Pacha night Flower Power. As a popular party on the island, adorned with decorations and the ethic of the cultural slogan of the ‘60s, the event will host international and local DJs in the scene. On Monday 2 January and Tuesday 3 January, Zagreb Gaming Arena will take over the Arena Zagreb from 10am to 10pm. Featuring gaming tournaments as well as exhibitions of the latest gaming industry technology, the event is ideal for fans of League of Legends, Counter Strike, FIFA 17 and more. Heart will take place in the evening of Monday 2 January with Julian Jordan and David Gravell followed by Laundry on Tuesday evening, 3 January with Sick Individuals, Kura and Thomas Newson. On Thursday 5 January, as the festival nears its close, TYLT will host performances by various DJs from Armin van Buuren's Armada label, which Dash Berlin, Dimitri Vegas & Like Mike, W&W and Lost Frequencies all call home. The final day, Friday 6 January, will play host to Giraffe Warehouse Project with Florian Picasso, ending week. Check www.croatiamusicweek.hr for more info.